A Manhattan trial court judge recently considered the claims of a woman who sued her building after being injured on the building’s staircase. The judge found that the plaintiff’s claims based on outdated or general code sections were not an appropriate basis for an award of personal injury damages. The case, titled Barnard v. 501 W. 45th St., was based on plaintiff Doreen Barnard’s claim against her building’s management. The building has a small set of stairs leading from the main entrance to the first landing. Barnard had repeatedly complained to the building’s management that the stairs were unsafe due to the trash allowed to accumulate there. As she was coming home one evening, she slipped and fell on one of the stairs, which were tiled with terracotta. The staircase had only one railing on the right side, so when Barnard reached out to the left as she fell, she was unable to get the support she needed to right herself, and was injured. Barnard filed a lawsuit against the building based on her injuries. The suit included claims for violations of the Administrative, Building Construction, Housing Maintenance, and New York City Health Codes. In response, the defendants presented evidence of the numerous inspections that the building had undergone over the years, and the absence of any penalties imposed by code inspectors. This evidence included the expert witness testimony of an engineer, Peter Chen. Chen stated that the building had been built prior to creation of the 1968 Administrative Code and had passed numerous inspections by the New York City Division of Code Enforcement since it was built. Chen also explained that Barnard’s claims based on certain administrative code sections were inapplicable since they described rules which applied to “interior stairs.” Under the law, a set of stairs aren’t considered “interior stairs” unless they lead to a “marked means of egress door.” In other words, the stairs must lead to the door that should be used in an emergency. Chen explained that the “interior stairs” in this building were the stairs on the external fire escape. Chen went on to testify that the stairs leading from the lobby appeared to be “substantially safe for use” without cracks or breaks, and otherwise free from any structural issues. 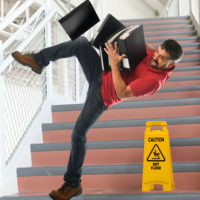 He also pointed out that slip-resistant metal nosings had been added to the stairs years before. Barnard presented her own expert, Stanley Fein, who testified that all New York City Codes have required handrails on both sides of a staircase since 1901 (the building had been inspected for the first time in 1913). Fein found that the stairs were in violation of the Housing Maintenance Code, as well as the New York City Building Construction code, which he alleged required management to keep buildings well-maintained and in a safe condition. The defendant filed a motion to dismiss the claims based on code sections, arguing that the sections on which Barnard based her lawsuit either did not apply to the facts of the case, had been revoked prior to the accident, or did not provide a right for Barnard to sue. The judge granted the defendant’s motion, dismissing all of Barnard’s claims which were based on the various code sections. The judge found the plaintiff’s expert testimony conclusory and unconvincing, and that it was only a recitation of the code sections that he claimed had been violated. The judge noted that Fein had not countered Chen’s testimony with any evidence that the stairs were dangerous or that the building failed to pass any code inspections. The judge’s opinion pointed out that several of the code sections cited by the expert either did not apply to the building at issue or facts of the case. While the code sections governing “internal stairs” may have provided grounds for a claim, the judge agreed that the stairs should not be considered “internal stairs” as the law defined them, making any claims based on those rules inapplicable. Barnard’s claims based on negligence by the building owners will move forward toward trial, but the claims based on code sections will not. If you’ve been injured in a slip-and-fall accident in New York, find an experienced, knowledgeable, and thorough attorney who can help you effectively pursue a claim for damages, and contact the Manhattan personal injury lawyer Leandros A. Vrionedes for a consultation at 212-889-9362, or in Queens at 718-777-5895.